How can frying a turkey bring us heat and light? Good question – so glad you asked! Cajun Frying a turkey involves a lot of peanut oil – 3 gallons for a medium to large bird, at $10 per gallon, or more, depending on the brand and where purchased. Have you ever wondered if there isn’t a better use for that expensive peanut oil used to Cajun fry your turkey each Thanksgiving than just the recycle center? Well, I did…and I found it! Peanut oil burns very well, unlike some other oils. Plant-based oils burn, including olive oil, but some definitely burn better than others. Some, like olive oil, are too thick and do not “draw” well, so they do not get a good burn. The fact that you can light a peanut and watch it burn should be a clue, but I suppose I had never really given it much thought. First, you need to let the oil cool after cooking with it, obviously. For us, that means allowing it to sit overnight. Then, you need to filter it, to get all the big stuff and the fine particles out (this is mostly seasoning from the bird, if you’re truly cooking it “Cajunized”). We filter through cheesecloth or a washable nylon screen we happen to have. I believe it actually was intended for drying sweaters on, so, there’s another “recycle”, but since you may not have one of these, I won’t count it in my “recycles”. Well, I tried burning used peanut oil like this as emergency lighting, and I must say, I’m very impressed with the results. Not only do I get to recycle peanut oil (and at $10 a gallon, that’s a very good thing! ), but I have used some other “recycles” in this project, as well. So, there’s recycle item # 1: peanut oil. We use a lot of paper towels in our house; we have not used washable towels for hand cleaning in 25 years or more; we use paper towels, and throw them away. What a waste! I’ve discovered a way to recycle those paper towels, and I’m truly amazed at how well it works. So, start throwing all those paper towels in a plastic tub or container of some sort, and try this experiment: soak them overnight in a strong salt water solution (you can recycle this, too! Just use it again). The next day, wring them out (gently), fold them tightly up, and twist into a “wick”; BTW, this would be a good project for children to help out with and keep them out of trouble for a while, as long as they don’t have cuts the salt water may irritate. Or give them disposable gloves. I found I had to have something to hold both ends in place, or the twist would immediately unravel; this is where I was able to recycle twist ties from food wrappers; you know, the kind that are metal wire with a plastic coating. I cut them in 2 or 3 pieces, depending on the length, and twisted a short length around both ends of my paper towel “wick”. Now let them dry (twisted up) for several hours, or even overnight. So there’s recycle item # 2: paper towels (you could probably recycle other papers like this; I’m told an old 100% cotton shirt will work, too, though I have not tried it) and recycle item # 3: twist ties from food wrappers. Soak your paper wicks in the recycled peanut oil while you continue to assemble your emergency lighting. Now for our fourth recycle item: those little metal holders from tea lights. Tea lights are very inexpensive; you can burn the tea light first, of course, then save the metal holders for this project; or, just remove the little candles and float them on water to burn, if you like; they will work but will burn out as the flame burns into the water level (obviously). Punch a hole just big enough to pull your wick through; I used an aluminum potato baking rod for this, the same rod I use to “maneuver” the burning wick, when necessary. Punch through GENTLY and work the hole until you can pull your paper wick (soaked in peanut oil) through. Remove the twist tie from the top and twist the top end tighter together before lighting. Save this piece of tie – you can use it many times. So, recycle # 4: metal tea light holders. Take a wide-mouth glass canning jar (I used a jelly jar) and fill it to within one and one-half inches of the top with your filtered peanut oil – no more than 2 inches headspace. There are some important notes here: (1) fire requires oxygen to burn; if you don’t add enough oil, if it burns too low in your container, it will burn temporarily and then go out; (2) wide mouth jars work best; (3) your wick must be completely dry, or it will not burn; (4) there can be no water in the container; (5) your wick must not be too short to burn; (5) you must have enough oil to get within 1 1/2-2 inches of top; if you don’t have enough oil, you can always use glass globs or marbles, or even pieces of broken glass or pottery, to elevate the oil level. Here’s an optional item: recycle # 5: metal campfire/light reflector; you can buy these at the Stuff Mart, if you don’t luck upon one at a yard sale. It simply gives you the most bang for your buck in emergency lighting (reflects the light, intensifying its effect). 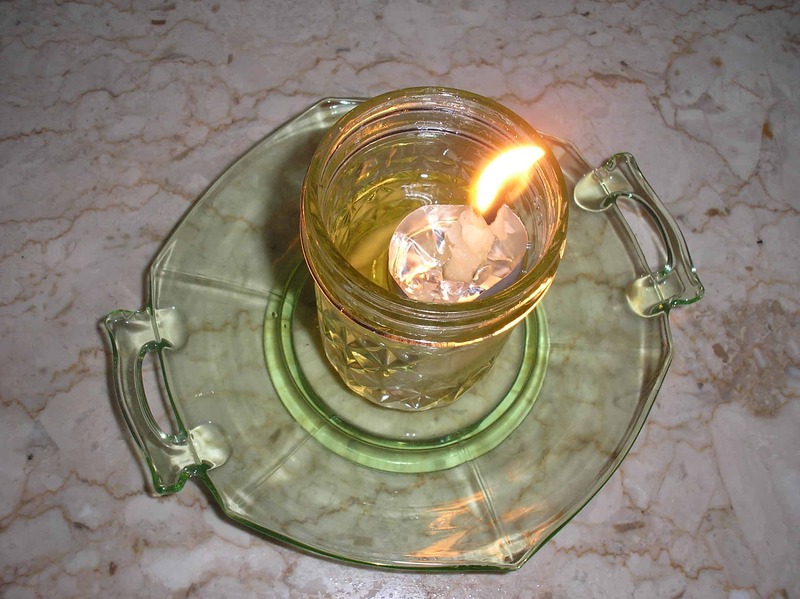 Place your pre-soaked oil wick in through the metal float; pull it through about an inch; remove the twist tie and twist the end tighter; light it; set it on your trivet; place your reflector around it, if you have one. Watch it give off heat and light! Mine is still burning, after about two hours, with a flame as good as when I first lit it; however, after 40 minutes, I had to remove the glass plate underneath (shown in pics) and replace it with an iron trivet, as jar was very hot; I had to wear oven mitts in order to handle the hot lamp jar at this point. It does give off a small amount of black smoke, but not much; I can tell you that as a severe asthmatic, it has virtually NO odor! What a blessing to those of us who smell everything. Poker: something safe to “poke” at the wick, to rearrange it as it burns (my aluminum potato baking rod works well). Give this a try; I think you, too, will be amazed at how much light (and even a bit of heat) just one of these little emergency lamps gives off. Think what you could do with lots of them! I hope you find this useful information. We unfortunately have never fried a turkey…but this is the first time I’ve seen the tealight suggestion! Great idea! I have found you can do the same thing with vegetable oil, and the cotton strings from a mop you can buy at the dollar store. I really like how you recycled the paper towels though, we go through a ton of them, and this is a great idea for repurposing something you would normally throw out. @grammyprepper: if you ever want instruction for a properly deep fried turkey, I think you know how to reach me?! @Brad: you’re right; veggie oil will burn, but, like olive oil, it does not draw as well, and it may give off more odor and smoke, depending on the type. Only one way to find out. Glad you found a useful tip. I gotta try this! My husband goes thru paper towels like they’re, well, paper towels!